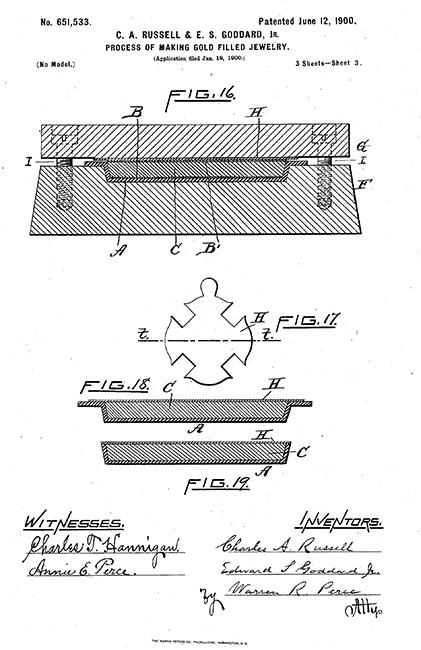 The patent on Gold Fill (process which is the same as Silver Fill) was filed in 1900 in Providence Rhode Island, the birthplace of the costume jewelry industry in the United States. In case you weren’t clear on Silver Fill versus Sterling Silver, our Silver Findings are produced from either Silver Ingot or Silver Pebbles which are melted in the process before they are squashed, rolled, squeezed and otherwise manipulated into all those tiny round balls, earwires, charms, tubes or whatever you can think of. Silver Fill seems an inaccurate name as you can clear see, there is no fill, that is the base metal, the silver sits on the outside. Silver-filled, like gold-filled, consists of precious metal (silver) bonded to a base metal substrate (a red brass alloy, CDA #220). The 1/20 and 1/10 notation refers to the ratio of silver to brass core by weight, which is 5% and 10%, respectively. The value of silver-filled is greater than silver-plated because silver-filled has an actual layer of sterling silver. The minimum thickness for silver plating is equal to 0.5 microns. In 1/10 silver-filled, 10% of the total weight of the metal is silver. In 1/20 silver-filled, 5% of the total weight of the metal is silver. In single-clad sheet, the silver layer is bonded to one side of the sheet of brass. In double-clad sheet, discs and other findings, silver layers are bonded to both sides of the sheet of brass. Silver Fill became popular when the price of silver soared above $48.00, clearly it was less expensive to use a base metal and silver of only ~10% of the weight. 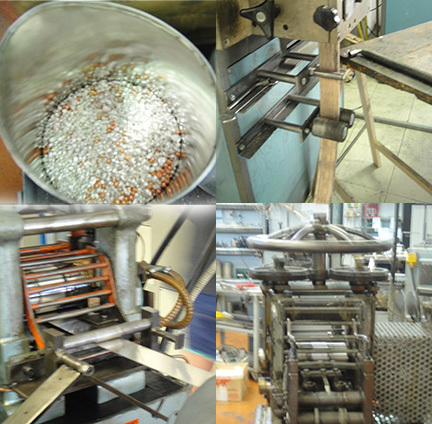 So to meet the demand, Silver Fill findings were produced. As you can see now silver fluctuates around $15 which means that the additional work required to bond the silver to the base metal negates real savings. 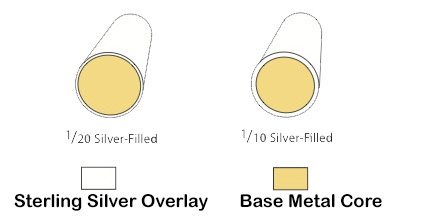 So once again Silver is popular and many of our suppliers have discontinued the Silver Fill in favor of Silver. When they discontinue Silver Fill, we will also as we sell out the existing inventory. ← Dichroic Glass – It’s Magic! I have never deliberately purchased silver fill. I am delighted that you are returning to sterling silver! 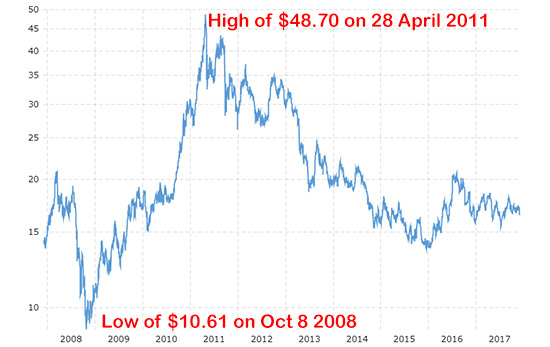 However, gold is still high. I am finding myself searching the web for 14/20 gold-filled findings, especially S clasps. I have resorted to handmade clasps sold mostly through etsy and etsy craft. The S clasps on the wholesale and commercial market are much too small for my application. Glad you agree. We were trying to explain to those who still request Silver Fill the reasons it came to be and why it simply isn’t practical at this point. Who wants to pay more for something less than Sterling?